The omnibus spending resolution adopted by the US House of Representatives just before midnight Thursday, and which is now before the Senate, is a detailed public statement of the priorities of the American ruling elite. The bulk of the more than $1.1 trillion in funding goes to the military and other repressive functions of the federal government, such as spying, prisons and the police. President Obama hailed the measure as a “bipartisan effort to include full-year appropriations legislation for most government functions that allows for planning and provides certainty, while making progress toward appropriately investing in economic growth and opportunity, and adequately funding national security requirements.” In other words, the bill makes it possible for the administration to continue waging war around the world and building up the apparatus for a police state at home. Attached to the funding bill are hundreds of policy measures, many of them added at the last minute with no public discussion and, in many cases, without most congressmen or senators even being aware of what was being proposed before they rubber-stamped the bill. These include, most notoriously, the repeal of a major section of the Dodd-Frank legislation that sought to place some restrictions on the speculative activities of the banks following the 2008 financial crash. The language in this section, permitting banks to use federally insured deposits to gamble in the swaps and derivative markets, was literally drafted by the banks. According to an analysis by the New York Times, 70 of the 85 lines in that section of the bill come directly from Citibank, which spearheaded the lobbying by Wall Street on this issue. The four largest Wall Street banks conduct 93 percent of all US derivatives trading, so the measure is a brazen demonstration of the subservience of Congress to the big banks. According to the Washington Post, Jamie Dimon, CEO of JP Morgan Chase, another of the big four banks, personally telephoned individual congressmen to urge them to vote for the amendment to Dodd-Frank. The House of Representatives passed the funding bill late Thursday by a vote of 219 to 206 after a delay of seven hours. The delay was to allow the Obama administration to pressure a sufficient number of Democratic congressmen to support the Republican-drafted bill and offset defections among ultra-right Republicans who wanted the legislation to block Obama’s executive order on immigration. The final vote saw 162 Republicans and 57 Democrats supporting the bill, while 136 Democrats and 70 Republicans opposed it. As always, just enough Democratic votes were found to assure that the reactionary measure passed, the government agencies were funded, and the financial markets were reassured. But in remarks to a meeting of the Democratic caucus, Pelosi gave the game away, refusing to seek a party-line vote and instead telling members, “I’m giving you the leverage to do whatever you have to do.” The second-ranking and third-ranking Democratic leaders, Minority Whip Steny Hoyer and Deputy Whip James Clyburn, broke with Pelosi and sided with the White House on the bill, openly recruiting the votes required for passage. Along with the $1.1 trillion bill that will fund most federal agencies through September 30, the House passed by voice vote a resolution funding the whole government through Saturday midnight, to give the Senate time to act on the main measure. The Senate approved this stopgap as well, and Obama signed it at the White House on Friday morning. Most press coverage of the funding bill gives the following breakdown of the spending: $521 billion for the military, $492 billion for nonmilitary items, and $73 billion in emergency spending, most of it military-related. This is highly misleading, since much of the “nonmilitary” spending is demonstrably in support of US military operations or domestic police and security operations directed against the American population. The $492 billion of “nonmilitary” spending includes the following, according to the official summary posted on the web site of Congress. (Click here and then page down to the section titled “Omnibus summaries,” which contains live links to department-by-department spending). · $11.4 billion for the National Nuclear Security Administration, the unit of the Department of Energy that assembles US nuclear weapons. · $40.6 billion for Department of Energy, NASA, NSF and other scientific research, much of it related to nuclear energy, cybersecurity and missile technology. · $65 billion for the Veterans Administration, which provides medical care and other services for those shattered in body and mind by their service as cannon fodder in American wars. · $26.7 billion for the Department of Justice, which includes the FBI, DEA and BATF ($10.7 billion), federal prisons ($6.9 billion), and aid to local police ($2.3 billion). · $25 billion for the Department of Homeland Security, which is funded only through February 27, 2015 because of its role in enforcing immigration policy (the full-year amount would be more than $60 billion). · $7 billion from the health budget for biodefense and bioterrorism research. · An undisclosed figure, believed to be in the range of $60 billion, for intelligence operations, including the CIA and 17 other federal agencies. At a minimum, these figures suggest that $236 billion, or nearly half, of the supposedly “nonmilitary” spending is actually directed to sustaining the military-intelligence capabilities of American imperialism. 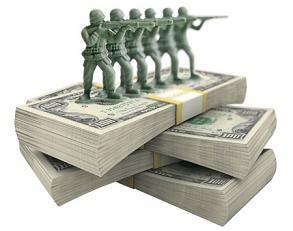 Adding that to the explicitly military and overseas contingency funding, the real dimensions of the US military-intelligence-police-prison complex begin to come into view: a staggering $830 billion, more than 80 cents out of every dollar in the funding bill, is devoted to killing, spying on, imprisoning or otherwise oppressing the people of the world, including the American people. · The bill provides $3.1 billion in aid to Israel, mostly financial subsidies, and $1.45 billion in aid to Egypt, most of it military, as well as $1 billion in aid to Jordan, another US client state in the region. · The bill eliminates the Obama administration’s Race to the Top program, used for six years to promote private charter schools and attacks on teachers in public schools. Republicans attacked the program as an effort to impose federal standards in education. · The bill bans enforcement of a series of environmental and labor regulations, ensuring that air and water will be more polluted and workers will be more brutally exploited.